The American Bald Eagle is the symbol for the United States of America and yet it was endanger of becoming extent. It wasn't until we passed laws prohibiting the use of DDT and provided for their habit, that they started to come back. If we want to keep those things which are precious to us we must protect them from those who would destroy them through neglect or personal gain. The eagle's breast is cut from petrified wood with the grain in the rock creating the effect of feathers. The tail feathers are cut from abenturine. 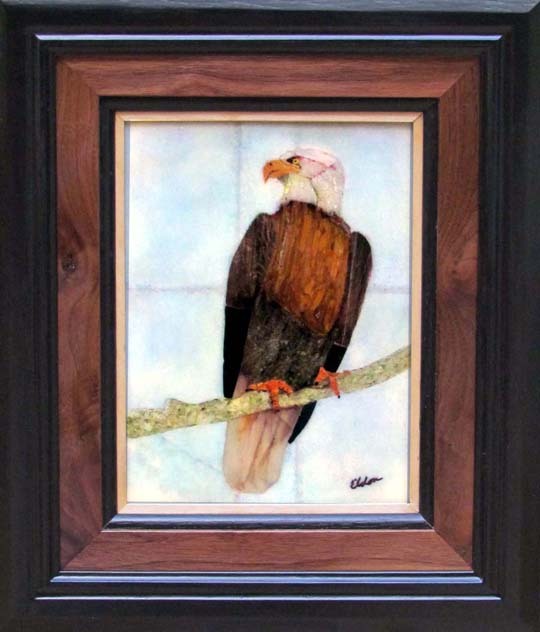 The wood frame is handmade with a mat of walnut wood which highlights the brown in the feathers.